As a Salesforce Silver Partner, we frequently get asked about Salesforce List Views. Users are always looking for Salesforce List View tips. With Salesforce list views you can filter on any field you have access to – on the object you are creating the view for – and you can choose up to 15 fields to display as columns. You can pick the order that the columns display in and you can even sort by a column ascending or descending. Each user can have their own personal Salesforce list views. Use Salesforce list views to speed up access to your important records. If you are creating list views for records you own, like “My Accounts in California”, then use the “My” criteria in the “Filter by Owner” section instead of adding an additional filter of “Owner = Your Name” (picture below). All object list views will have the “Filter by Owner” section. If your company is using teams (Account, Sales, or Case), then you can use the “My Team’s” option to see all records owned by all members of the team(s) you are a member of. Activity Salesforce list views use the “My Team’s” option differently. This option shows activities owned by users who report to you in the role hierarchy so it may not be available if no users report to you. Activity list views give you the option to show your delegated activities. This will show you all of the tasks you created but assigned to someone else. Use the “Closed = False” additional criteria so only open activities show in the list (picture below). When you sort on a text or picklist column, you have the additional option to only show one letter of the alphabet in the view. In the picture below, I am sorting by the “Account Name” column and then I selected the letter D. This is a quick way to zero in on the record you are looking for. You can also drag the lines between the columns to make them wider or narrower to meet your needs. The column widths will stay as you set them until the list view is edited. When edited, the columns go back to their default widths. With “Inline Editing” and “Enhanced Lists”, you can even edit certain fields right in the lists. When hovering over a field in a list view with your mouse, you will see a pencil icon (picture below) next to fields that are editable. Just double click on the field and edit away. You are not limited to one record. By using the “Action” boxes on the left, you can select up to 200 records at one time to edit (picture below). Then double click in the field to bring up the edit window. In the picture below, I have chosen to update the four selected records with a rating of cold. Save and you are done. This is much quicker than editing each record individually! Use mass edit list views if you need to make the same change to many records. For instance, say you want to start using the “Rating” field on the lead page and want to start all of your leads out as “Cold”. You could create a lead list view with the criteria of “Rating = “ leaving the value field blank. Then you can mass update 200 leads at a time and they will fall out of the list when you refresh. If you are using record types, or if you want to edit tasks in a list view, then you need to specify the record type in the list view criteria (or use “Task = True”) in an activity list view. 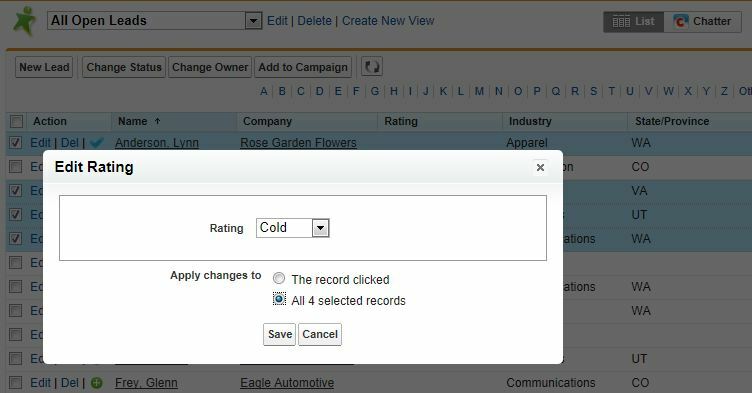 Salesforce only allows Salesforce list views for a single record or activity type. What if you could support YOUR team with information like this?